Jean de Luxembourg, King of Bohemia was born on 10 August 1296. He was the son of Henri VII de Luxembourg, Holy Roman Emperor and Marguerite de Brabant.2 He married, firstly, Elisabeth of Bohemia, daughter of Wenceslas II, King of Bohemia and Jutta von Habsburg, on 31 August 1310. He married, secondly, Beatrice de Bourbon, daughter of Louis I de Clermont, Duc de Bourbon and Marie de Hainaut, in 1334.3 He died on 26 August 1346 at age 50 at Crécy, FranceG, killed in action. Marie de Châtillon was born circa 1343. 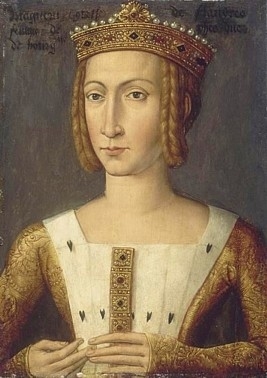 She was the daughter of Charles de Châtillon, Comte de Blois and Jeanne de Penthièvre.1 She married Louis I, Duc d'Anjou, son of Jean II, Roi de France and Bonne Judith de Luxembourg, on 9 July 1360. 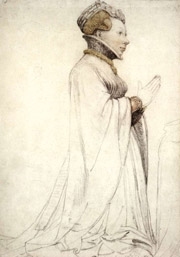 She died on 12 November 1404. He gained the title of Comte de Blois.1 He gained the title of Duc de Bretagne in 1341. She gained the title of Comtesse de Flandre.